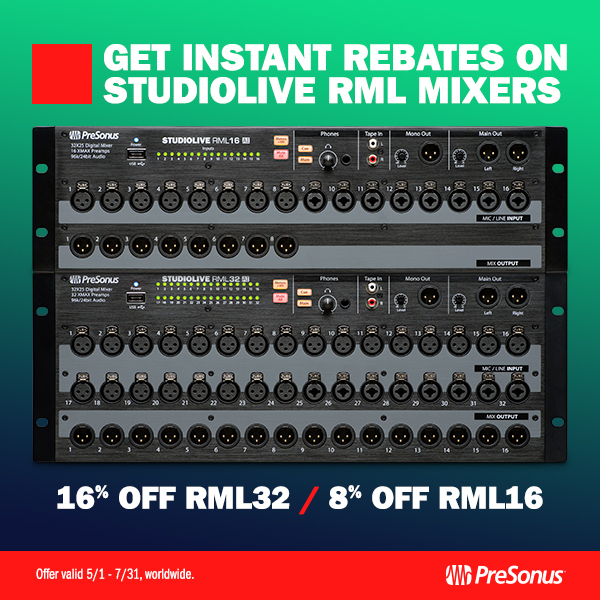 The StudioLive RML Mixers have a discount offer going on currently—no rebate form or paperwork required, just less cash at the register! Equally at home in houses of worship, schools, broadcast facilities, live venues, touring rigs, and recording studios, the PreSonus StudioLive RML rackmount digital mixers are a versatile and flexible solution for live sound and recording. Expandable up to 64 channels and flawlessly integrated with state-of-the-art software, they boast an integrated multitrack recording interface, advanced AVB or Dante networking, and multiple control options. Yet they’re easy to use, with a workflow that will let you focus on mixing, without being distracted by the technology.